I read about Reverb10 in the days coming up to December. I loved the idea of writing every day this month to reflect on the year past, and to imagine the year ahead into being. At the same time, I was pretty sure I wouldn’t adhere to a schedule, so I didn’t sign up officially. Breathe through the pain (my fall, early in the year). Breathe through the far worse pain of Kristina’s injuries (I have yet to write about that here). Breathe through the fear and worry about her recovery. Breathe to heal. Breathe to relax. Breathe in relief. Take a breath. It happens anyway. 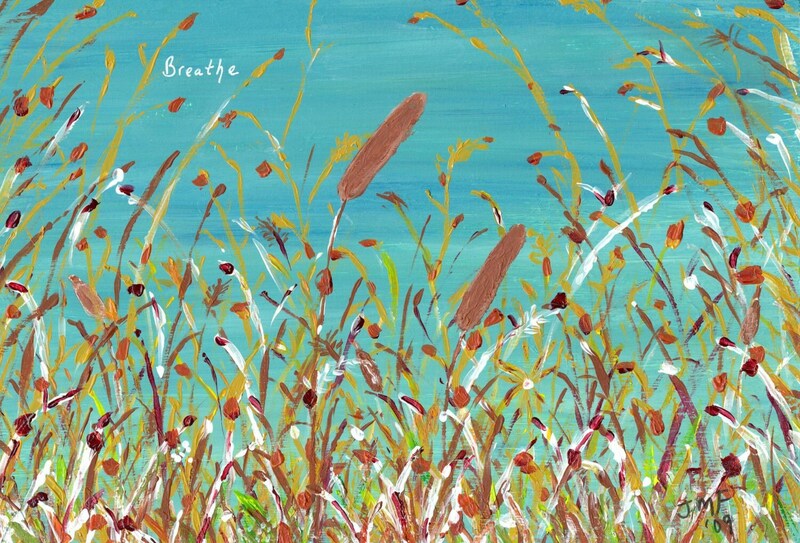 Breathe, like this painting by Julia Fehrenbacher. Breathe, like this photograph by Sarah Jean. 2010 was a year when I had to remind myself – over and over – of this simple thing. As we approach 2011, I have several words in mind, contemplating how I would like to set the year. The phrasing of the prompt threw me though, with it’s after-the-fact look back at 2011. And, another, a word not already on my list, a word I think may be the word, my one little word for 2011. I’ll keep you posted. On the Christmas calendar today, a tin of peppermint cocoa. Yesterday, we brought out the Christmas music. i am stoked to hear more about your word for 2011. i adored your ‘nourish’ so much. Every time i used that word… i thought of you, which was frequently. I love the word stoked. It says so directly what you mean. Nourish was – still is – a good word for me. I didn’t update on this site very much about it, after the first part of the year, but it stayed with me even so. I learned a lot about taking care of myself this year. I’m thrilled that it carried meaning for you as well. Maybe you’ll come up with your own word for 2011? I’d love to know what it would be. Such a great post — I love the way that focusing on our breathing forces us to be in the moment. It sounds like you are ready for 2011. Also, so delighted to see that you posted one of my pictures. It means so much!